The Nigerian police have arrested and paraded eight suspects over alleged kidnapping, murder, ritual killings, exhuming dead bodies from where buried, removing and trading in human skull and other human body parts in Ilorin, Kwara state. The suspects, according to the police confessed and admitted to have sold thirty one (31) human heads to some personalities in Ilorin and other towns in Kwara State. The suspects are Azeez Yakub a.k.a Baba Muri – Principal Suspect, Abdulrasaq Babamale, Aishat Yunisa, Lukman Saka, Ahmed Yahaya a.k.a Eko, Abdulfatai Kadri a.k.a (Adedoyin) – Vigilante Commander, Adeta Zone, Ilorin; Soliu Ayinde a.k.a Baba Fawasi and Abdulganiyu Bamidele. According to the Police Public Relations Officer, Jimoh Moshood at the Force Headquarters, Abuja on Wednesday he said upon on several complaints received at the ‘D’ Divisional Police Headquarters, Adewole, Ilorin Kwara State on cases of missing persons, kidnapping, murder, killings for rituals, and exhuming of dead bodies from where buried, removing of human skull and other human parts of their victims; the Inspector General of Police on receipt of the Situation Report from the Kwara State Police Command immediately directed the IGP Monitoring Unit to proceed to Kwara State and assist the Kwara State Police Command in their investigation of the matter, arrest perpetrators to bring them to justice. The Police Joint Investigation Team on arrival to Ilorin, Kwara State on the 5th of October, 2018 assisted by the personnel of ‘D’ Divisional Police Headquarters, Adewole, Kwara Police Command, working on actionable intelligence from public spirited individuals in the area, swung into action, obtained search warrant and moved into the house of one Azeez Yakub of No. 20 Ile Opa Adeta Compound, Ilorin. During the search Eleven (11) Human Skulls, some pieces of human bones, human hairs, and powder suspected to be grinded human bones and charms were recovered in the house. Further investigations by the Special Team of the IGP Monitoring Unit led to the arrest of Seven (7) other suspects, Azeez Yakub, Abdulrasaq Babamale, Aishat Yunisa, Lukman Saka, Ahmed Yahaya, Abdulfatai Kadri a.k.a (Adedoyin) – Vigilante Commander, Adeta Zone, Ilorin, Soliu Ayinde a.k.a Baba Fawasi, Abdulganiyu Bamidele. The suspects involve in kidnapping, murder, ritual killings, exhuming of dead bodies from where buried in the community, removing their vital body parts such as the skull, genital organs, eyes, human hair, certain body bones and sell to prominent personalities in the country for rituals and spiritual powers. The suspects confessed and admitted to have sold Thirty One (31) human heads to some personalities in Ilorin and other towns in Kwara State and other contiguous states to Kwara State. i Azeez Yakub a.k.a Baba Muri (Principal Suspect) who is a notorious armed robber and have been arrested, charged to court and convicted to prison severally. This suspect now in Police custody has made confessional statement to the Police investigation Team, he confessed and admitted that one Abdulfatai Kadri a.k.a (Adedoyin), the vigilante commander in Adeta Zone, introduced him to the business and also supplies the human skulls and other body parts for him to sell. Eleven (11) Human skulls were recovered from his possession during police search on his residence. The principal suspect confessed that Abdulfatai Kadri has brought to him Twenty (20) human skulls that he exhumed from the Ilorin Community Central Burial ground situated after idl-praying ground in Ilorin, Kwara State. He further admitted that Abdulfatai Kadri a.k.a (Adedoyin) usually brings in the human heads to him in batches of Four (4), six (6), Eight (8) for safe keeping and usually collect them within a day or two, and also informed him of the personalities in Ilorin and other he usually supply the heads to. iv. Ahmed Yahaya and Lukeman Saka were indicted in the confessional statement made by the Principal suspect, Azeez Yakub. 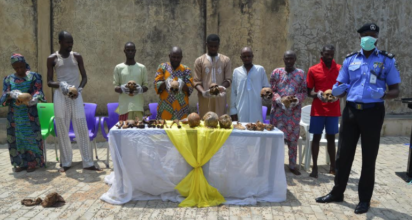 They confessed to have bought two (2) human skulls from the principal suspect through Aishat Yunusa, grinded for their usage and rituals. v. Abdulfatai Kadri a.k.a (Adedoyin) is a vigilante Commander in Adeta Zone indicted by the Principal suspect to have introduced him to the business and also supplies the human skull and other body parts for him to sell. He is still being investigated on his criminal roles in the incident. vi. Soliu Ayinde a.k.a Baba Fawasi – this suspect also in police custody confessed and admitted to be a member of the syndicate who receives human parts from both Abdulfatai Kadri a.k.a (Adedoyin) the Vigilante commander and Azeez Yakub the Principal suspect. In his possession was recovered human bones cut-off from the leg of one of their victims. He admitted to the Police investigators that the Principal suspect Azeez Yakub and Abdulfatai Kadri a.k.a (Adedoyin) are working together. At a time he requested for human skull from Azeez Yakub, in his presence, Azeez Yakub called Abdulfatai Kadri a.k.a (Adedoyin) to bring the human skull after collecting Fifteen Thousand Naira N15,000 from him. vii. Abdulganiyu Bamidele: He confessed and admitted to buying human skull from the principal suspect, Azeez Yakub and supply same to his friend one Kayode still at large. All the suspects have made confessional statements to the Police Investigation Team and have confessed and admitted to the various criminal roles they played in the recent kidnapping, gruesome murder and ritual killing attacks on innocent residents in Ilorin Metropolis and other towns in Kwara State.